Typing of the Dead: Overkill is amazing already. 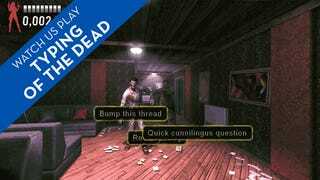 It's a game where you kill zombies by typing words like "Brains". Apparently that wasn't enough, so with Filth of the Dead, they've added in what appears to be all of Urban Dictionary. Between the weird things that normally come up ("wafer thin mint", "electric boogaloo") and the added dirty words, I basically had no idea what I was typing for 15 minutes. You can check out the video to get a feel for the game, and I transcribed some of the terms for your enjoyment below. You can pick up Typing Of The Dead: Overkill on Steam.